Camino Minerals Corp. (TSXV:COR, OTCQB:CAMZF, FRANKFURT:XC01GR) (“Camino” or the “Company”) has completed an extensive surface exploration program within the Diva trend at the 20,000 hectare Chapitos Copper-Gold project, near Chala, Southern Peru. In total, 851 rock samples have been collected and have now delineated a 7km by ~1.5km area that we have named the “Diva trend.” The rock samples were submitted to ALS Global for analysis and their copper results ranged from less than detection up to 15% Cu, with an average of 0.69% Cu. The Diva trend is host to the Lourdes, Adriana, Katty, Maria, Pilar, and Vicky copper occurrences. The Diva trend is open to the northwest and to the southeast and to date less than 20% of this trend has been drill tested (Adriana, Katty, and Vicky occurrences) and the rest remains open. Along the Diva trend, surface copper mineralization comprises mainly copper oxides (malachite and chrysocolla) with minor sulphide (chalcopyrite and pyrite). The Company has recently completed a review of the 2017 and 2018 drill core from the Adriana zone and has identified copper mineralization and hydrothermal alteration associated with several discreet breccias. 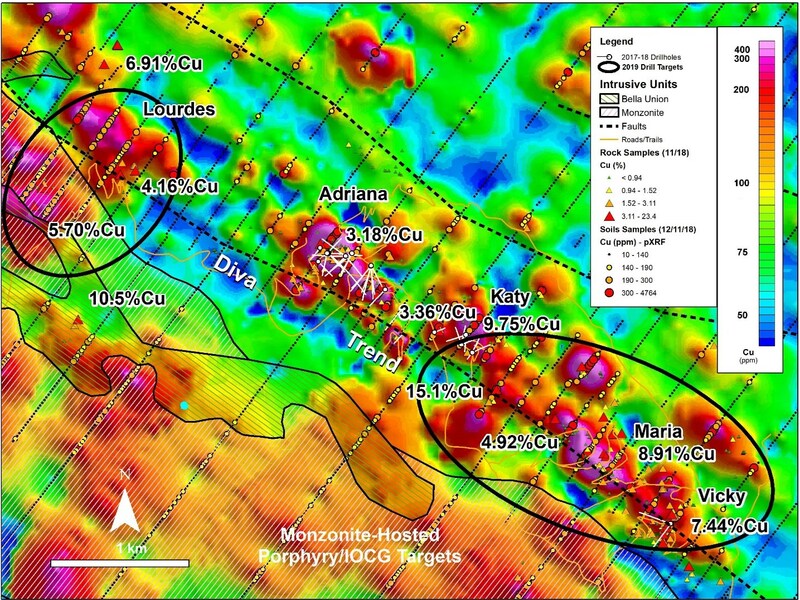 As a result, the Company is now examining the applicability of the Chilean Manto Cu deposit model to certain parts of the Chapitos Property, including the Adriana Zone within the Diva Trend. This is based not only upon the recognition of mineralized breccias that appear to be a primary control on Copper mineralization, but also upon the recognition of possible albite (sodic) alteration of volcanic host rocks proximal to breccias and possible metal zonation throughout the Adriana drill core with Cu-rich chalcocite dominant mineralization in the core of breccia zones and a ‘lower weight %’ Cu assemblage of bornite-chalcopyrite-pyrite peripheral to the breccias. Additional petrographic and geochemical work is underway to further investigate these observations. Images can be viewed at the Company’s website. Camino is a discovery-oriented mineral exploration company. The Company is focused on the acquisition and development of high-grade copper and precious metal projects. For more information, please refer to Camino’s website at www.caminominerals.com. John Williamson, P.Geol., President, CEO and Director of Camino, is the Qualified Person as defined in National Instrument 43-101 and has reviewed and approved the technical contents of this press release. Click here to connect with Camino Minerals Corp. (TSXV:COR, OTC:CAMZF, FRANKFURT:XC01GR) for an Investor Presentation.